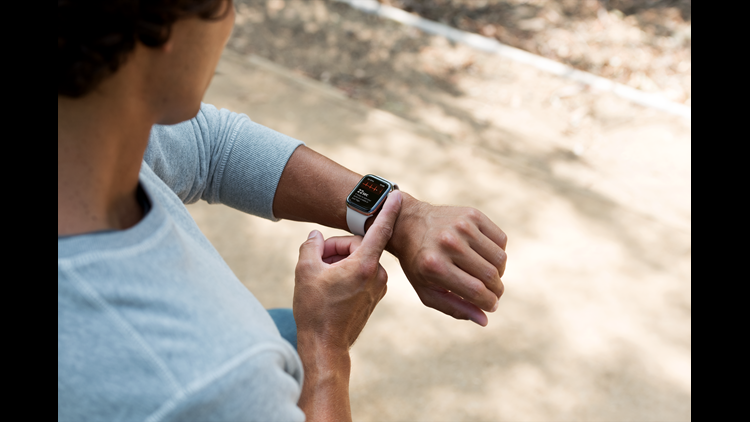 How big is Apple's focus on health tech? This strong conviction comes from none other than Apple CEO Tim Cook, who commented to USA TODAY ahead of Thursday’s launch of two previously announced new heart-related features for the Apple Watch. The first is an irregular heart rhythm notification feature that will work on all existing Apple Watch models. 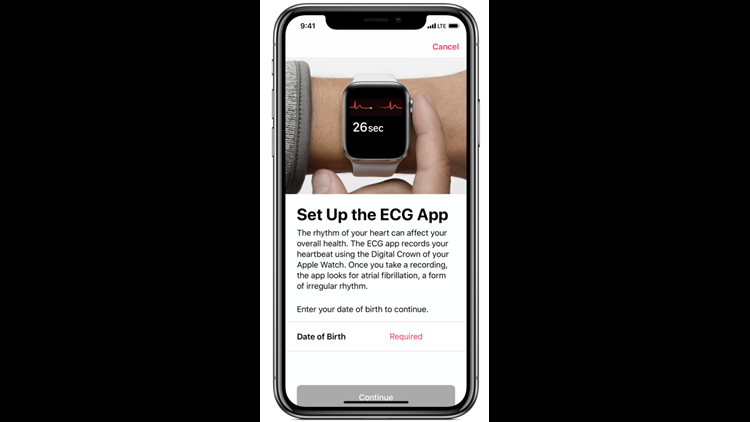 The second, an FDA-cleared ECG app, is reserved for the newest, and at $399 to start, most expensive Apple Watch, the Series 4. The Apple Watch cannot detect a heart attack. Together, these new features may identify signs of atrial fibrillation or AFib, a common cause of stroke. These latest tools complement the high- and low-heart-rate alert features that have already been available on the Apple Watch. The Series 4 also has had a feature that will automatically detect a fall, and summon emergency assistance if you need it. To take advantage of the new heart features, you’ll have to fetch watchOS 5.1.2, which is expected to be available sometime Thursday, and iOS 12.1.1 on your iPhone, which Apple made available the day prior. Apple has clear messaging when you set up the ECG feature on the Apple Watch. I was able to go through the set-up process for both new features and try the ECG app on a Series 4 loaner from Apple in advance. You’ll have to share your birth date as part of this drill, because neither new feature is meant for someone under 22 years of age. Apple encrypts your data with a passcode. If you choose to backup the data on iCloud, it will also be encrypted there. After opening the ECG app on the watch itself, you hold your finger against the digital crown for 30 seconds. I actually felt a bit nervous watching the watch count down while doing so. ECGs (also known as EKGs) measure the timing and strength of the electrical pulses that keep your heart pumping. Electrodes are built into the back crystal and digital crown of the watch. The results of the test show up in the Health app your iPhone; if you wish, you can share a PDF with a graphical waveform strip with your doctor. 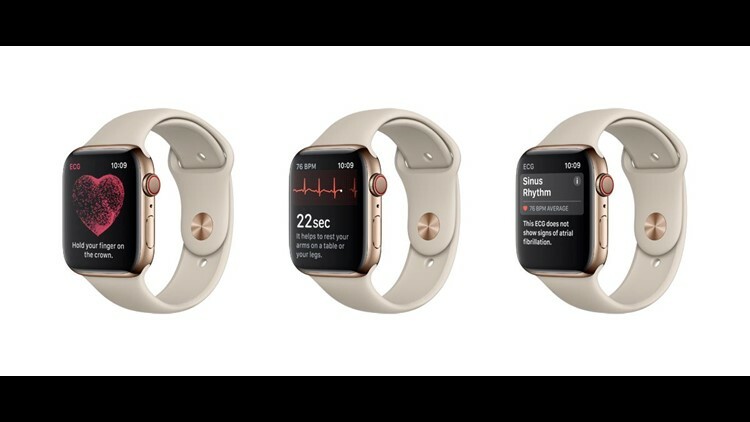 Apple Watch can detect AFib, a common case of strokes. Apple received a “De Novo” classification from the FDA for the feature, meaning it is a direct-to-consumer first of its kind. The company went through a clinical validation for the ECG feature with about 600 patients. I worried, frankly, that a consumer unschooled in medicine—so, most of us—might stress taking a test, especially if some issue is flagged. 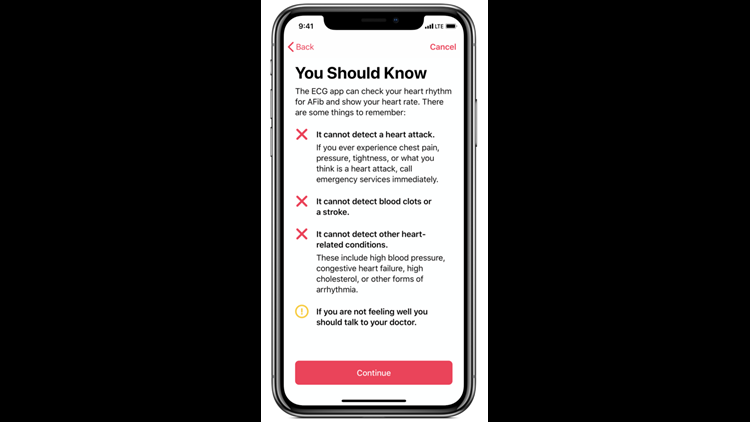 But Apple does an excellent job throughout the process of explaining what AFib is and what you should do if you receive an alert or a particular result. According to the company, you shouldn't take advantage of the irregular heart rate notification feature if you’ve already been diagnosed with AFib. Why? The watch only checks in the background for AFib every two hours or so, usually when you are still to ensure a more accurate reading. Apple doesn’t want to communicate the wrong impression. Just because you don’t get an irregular heart rhythm alert does not mean you’re necessarily in the clear. And by no means should you change or stop taking medicines your doctor has prescribed. The company also is up front about one of the things that Apple Watch cannot do, notably detect a heart attack. If you do experience chest pain, pressure, tightness or other symptoms, by all means, seek medical attention immediately. Another disclaimer: The Watch cannot detect all instances of AFib, so you may not get a notification even if you have it. In fact, you’ll receive a notification only if Apple detects AFib five consecutive times within a certain time frame. After the Apple Watch ECG feature delivers a result, you'll see a waveform you can share with your doctor. As for the ECG app, even before you are able to try it, Apple explains the results you may see, which fall into one of three categories: A “sinus rhythm” means the heart is beating in a uniform pattern, because the upper and lower chambers of the heart are beating in sync – what was reported to me in my own tests. Again, don't take anything for granted. The result applies only to this one particular recording and doesn’t mean your heart beats with a consistent pattern all the time. If you feel lousy, get medical attention, regardless of the result shown. If the watch gives you an “AFib” result, it means the ECG detected an irregular pattern and you should get in touch with a doctor. Don’t panic because the condition is manageable. But left untreated, it can cause a blood clot that may lead to a possible stroke or heart failure. Even with an AFib result, you may or may not experience symptoms. A third possibility is that you’ll receive an “inconclusive” result, which can happen for any number of reasons, including a wet electrode (remember you can swim with Apple Watch) or a band that wasn’t snug enough on your wrist. You’re also advised to move away from any electronics that are plugged into an outlet to avoid electrical interference. Moreover, some people’s physiology doesn’t support the kind of single-lead ECG test that the Watch can perform because of the position of their heart inside the body. Another thing to keep in mind is that the app can’t classify the results if your heart rate is above 120 or below 50. Under such circumstances, you can still share the waveform with your doctor. You’ll also get an inconclusive reading if you have a pacemaker. 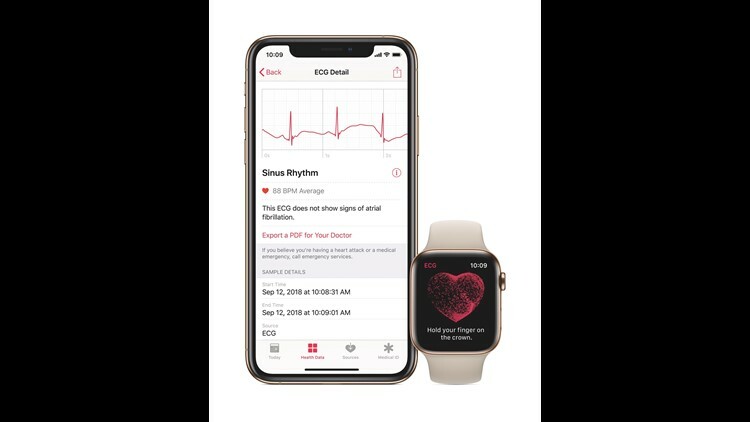 Apple says you should not be taking an ECG for fun, though I’ll bet nearly everyone reading this who has a Series 4, will try the feature at least once. The key use case is for people who do experience symptoms, and you’ll be able to record such symptoms by tapping options on the watch screen. If you tap “chest pain” as one of those symptoms, you’ll be prompted to call emergency services. You can call 911 from the watch. It’s also important to remember that the single-lead ECG on the watch is more limited than the ECG you may get in a cardiologist’s office, in which nodes are placed all over your body to capture a 3D picture of your heart. Apple’s designs on cracking the health care market isn't new. The iOS Health app has been around since 2014, used for, among other purposes, tracking your steps, nutrition and housing a medical ID with your blood type, medications and emergency contacts. Earlier this year, Apple updated the app on the iPhone so that you could store all your disparate medical records in one place.